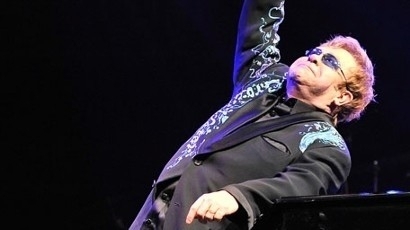 Elton John is making a good recovery following his hospitalisation earlier this week, according to reports. The iconic singer was taken to Cedars-Sinai Hospital in Los Angeles earlier this week (May 23) so he could receive treatment for a respiratory infection, forcing him to cancel a run of shows in Las Vegas. A spokesperson for John, however, told ET Online that he was "at home and doing well" following his spell in hospital. John himself had previously apologised to fans for having to scrap the scheduled gigs, stating: "It feels strange not to be able to perform these 'Million Dollar Piano' concerts at the Colosseum... I love performing the show and I will be thrilled when we return to the Colosseum in October to complete the 11 concerts… All I can say to the fans is 'sorry I can't be with you'." Elton John is still set to tour the UK next month and will release a new album titled 'The Diving Board' this autumn. Speaking about the LP, which is the follow-up to his 2010 effort 'The Union', he claimed that the album was his "most exciting" for a long time and said he was 'psyched' about the finished product.